Jonah Krampitz: I’m having a lot of fun trying out different characters and improving. The idea of fooling around and eventually making scenes based off random scenes is cool. The writing is mostly good, especially writing scenes. I like the games we play to stall time. The best part, though, are the people here. They are all committed to making something great, and going outside their comfort zone to try something. We’re all comfortable here which is awesome for a first-timer like me. All in all, Young Company is the best company I have ever been to. Katrina Wilensky: One thing I really like about Merrimack Repertory Theatre is how I can really challenge myself. Also, unlike some other theatre companies, nobody is put below anybody else or thought to be less talented. My confidence is constantly being challenged and encouraged. I love that. Another thing I like about Merrimack Repertory Theatre is how kind and welcoming everyone is, from my teachers to instructors to follow castmates. It’s just a really positive environment. Also, I am allowed to be creative and everybody listens to my ideas, which I love. All ideas are valid here. It’s great. Tyler Higgins: What I’ve enjoyed so far at the halfway point of this program is the creative freedom that we received while working on our play. The amount that we were able to contribute as writers was very constructive while also liberating. It really allowed us to excel at our own writing prowess, while also contributing to the play in a very fun and original way. When in the program you feel heard, like your ideas matter, and that while not everything is a right answer, in can most likely be used somewhere. It really shows you how to work in ideas and gives you a stronger understanding of the creative process as a whole. Taylor Wright: I think that this year’s program is very different from when I did it two years ago. Which is good. I like the way everything is set up. I love doing all the activities and games. They really made me loosen up and enjoy things, I’m very comfortable with everyone and I’m happy I get to be working with everyone and pushing myself to be more comfortable around people. Lexi Wright: So far this week has been amazing... the activities we do and the workshops we do are so easily organized, we’re not doing anything random. The kids here are wonderful. They’re so outgoing and accepting. They’re all comfortable with who they are. The adults here are also fun to work with. I feel really comfortable around them. They give really helpful feedback. Kayla Van: What I like about this program is EVERYTHING. I liked meeting new people, the exercises, especially that no one is going to judge you. The Improv is really fun, too. John Cena (JK) told us what we were then, we asked the others what to do next. But there were time limits like 30 seconds or 20. The people here are awesome, even though we have some disagreements. The people who come in like Nick and John are really nice, they taught me so many things that I will never forget. Also when it’s almost time to leave, we play some really fun games that I’ve never played before and we have a little meeting at the end of the day. Victoria Beauchamp: I have had a really fun time at Young Company. We worked a lot on acting and playwriting. The first two days we worked a lot on playwriting. The two days after that we worked on improv. Improv was my favorite thing we did at Young Company. We all worked together to give each other acting parts where a person would stand up and do improv with what the rest of the class told them to do. Also we got to write out small scenes with a group of one or two, writing scenes was a lot of fun but did require a lot of hard work. We also wrote a lot in journals that they gave us. We wrote out separate scenes in ou notebook and we could share if we wanted to. We have a guest choreographer to help us with a dance we will put on in our play. When we did the writing and role playing to guest people came in to teach us. The program really taught us how to make our acting better. We also made tableaus. Tableaus are a frozen picture where the students act it out. 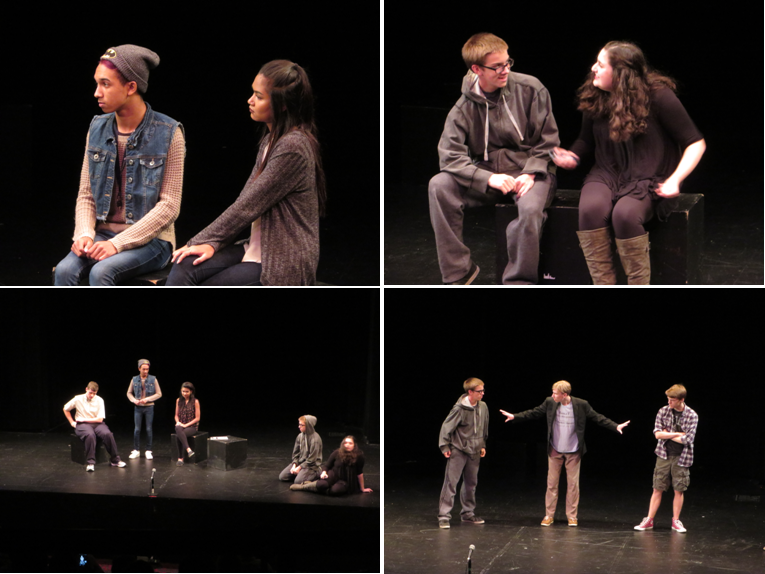 Tableaus that we make usually come after we make our skits and perform them to each other. I had a lot of fun learning how to act and write plays. Balquis Tomoum: I am really happy to come here to the MRT. I really like writing. I write about many things. I write plays, stories of fake persons and comics. Writing is my real thing, the MRT helps me to know to write scenes in the best way. Acting on the other side is a hobby to me. I like to learn how to act, because I really have a weird thing I like to do best in acting which is an evil laugh, or when I cry. I feel very professional when I just laugh or cry. The best things I really enjoy at the MRT is how they make us write our own scenes/plays, and how they make us communicate with each other every morning by sharing anything we did, enjoyed, or talk about animals or horror movies or even trees. On the other side, the MRT lets us play really fun games about acting mostly after we finish all the work we did in the day for 30 minutes (I think so.) I really had fun in the few days I came and I am looking forward to make our own play. Chloe Therrien: Over the week, I had really enjoyed Young Company. We have had such fun times and I really feel like I have learned more about acting and writing a play. I feel that all of it has been a fun experience, but I have to say one of my favorite things was writing plays with Nick. Nick really knows what he is doing and I felt that he taught us a lot in the time that he was with us. One of my favorite things that we did was creating characters. Creating dialogue for them was also fun. Also, I really enjoyed improv with John. He gave us great tips not only for improv, but also for writing a play. These tips included things like including the setting, characters, and action into the scene. Best of all, he made fun games out of it. Overall, even though I still have a week to go, the whole experience of MRT Young Company so far has been amazing!